calibre has a conversion system that is designed to be very easy to use. Normally, you just add a book to calibre, click convert and calibre will try hard to generate output that is as close as possible to the input. However, calibre accepts a very large number of input formats, not all of which are as suitable as others for conversion to e-books. 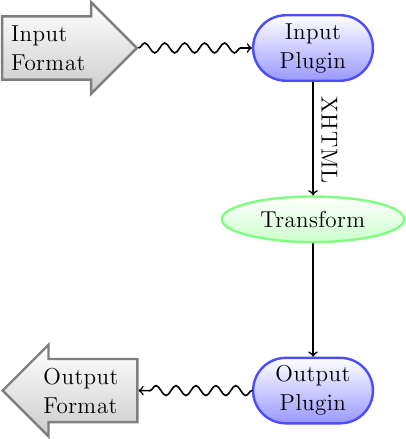 In the case of such input formats, or if you just want greater control over the conversion system, calibre has a lot of options to fine tune the conversion process. Note however that calibre's conversion system is not a substitute for a full blown e-book editor. To edit e-books, I recommend first converting them to EPUB or AZW3 using calibre and then using the Edit book feature to get them into perfect shape. You can then use the edited e-book as input for conversion into other formats in calibre. terhurai The result of pre-processing and converting to XHTML the output from the Input plugin. Use to debug structure detection. struktur Pengesanan struktur pasca, tetapi sebelum meratakan CSS dan penukaran saiz fon. Digunakan untuk menyahpepijat penukaran saiz fon dan penjelmaan CSS. diproses Just before the e-book is passed to the Output plugin. Use to debug the Output plugin. Normally, calibre will automatically choose a base font size appropriate to the output profile you have chosen (see Persediaan halaman). However, you can override this here in case the default is not suitable for you. The Font size key option lets you control how non-base font sizes are rescaled. The font rescaling algorithm works using a font size key, which is simply a comma-separated list of font sizes. The font size key tells calibre how many "steps" bigger or smaller a given font size should be compared to the base font size. The idea is that there should be a limited number of font sizes in a document. For example, one size for the body text, a couple of sizes for different levels of headings and a couple of sizes for super/sub scripts and footnotes. The font size key allows calibre to compartmentalize the font sizes in the input documents into separate "bins" corresponding to the different logical font sizes. Semua penskalaan semula saiz fon dalam pertukaran format boleh juga dilumpuhkan di sini, jika anda mahu kekalkan saiz fon seperti dalam dokumen input. A related setting is Line height. Line height controls the vertical height of lines. By default, (a line height of 0), no manipulation of line heights is performed. If you specify a non-default value, line heights will be set in all locations that don't specify their own line heights. However, this is something of a blunt weapon and should be used sparingly. If you want to adjust the line heights for some section of the input, it's better to use the Extra CSS. Finally, there is Input character encoding. Older documents sometimes don't specify their character encoding. When converted, this can result in non-English characters or special characters like smart quotes being corrupted. calibre tries to auto-detect the character encoding of the source document, but it does not always succeed. You can force it to assume a particular character encoding by using this setting. cp1252 is a common encoding for documents produced using Windows software. You should also read How do I convert my file containing non-English characters, or smart quotes? for more on encoding issues. Then, in your source document, mark the paragraphs that need spacing with class="spacious" . If your input document is not in HTML, use the Debug option, described in the Introduction to get HTML (use the input sub-directory). Enabling this option will cause calibre to attempt to detect and correct hard line breaks that exist within a document using punctuation clues and line length. calibre will first attempt to detect whether hard line breaks exist, if they do not appear to exist calibre will not attempt to unwrap lines. The line-unwrap factor can be reduced if you want to 'force' calibre to unwrap lines. This function will not create a TOC, but in many cases it will cause calibre's default chapter detection settings to correctly detect chapters and build a TOC. Adjust the XPath under Structure detection if a TOC is not automatically created. If there are no other headings used in the document then setting "//h:h2" under Structure detection would be the easiest way to create a TOC for the document. Some publishers format chapter headings using multiple <h1> or <h2> tags sequentially. calibre's default conversion settings will cause such titles to be split into two pieces. This option will re-number the heading tags to prevent splitting. This option will cause calibre to analyze blank lines included within the document. If every paragraph is interleaved with a blank line, then calibre will remove all those blank paragraphs. Sequences of multiple blank lines will be considered scene breaks and retained as a single paragraph. This option differs from the 'Remove Paragraph Spacing' option under 'Look and Feel' in that it actually modifies the HTML content, while the other option modifies the document styles. This option can also remove paragraphs which were inserted using calibre's 'Insert blank line' option. With this option calibre will attempt to detect common scene-break markers and ensure that they are center aligned. 'Soft' scene break markers, i.e. scene breaks only defined by extra white space, are styled to ensure that they will not be displayed in conjunction with page breaks. In general you should avoid using HTML tags, calibre will discard any tags and use pre-defined markup. <hr /> tags, i.e. horizontal rules, and <img> tags are exceptions. Horizontal rules can optionally be specified with styles, if you choose to add your own style be sure to include the 'width' setting, otherwise the style information will be discarded. 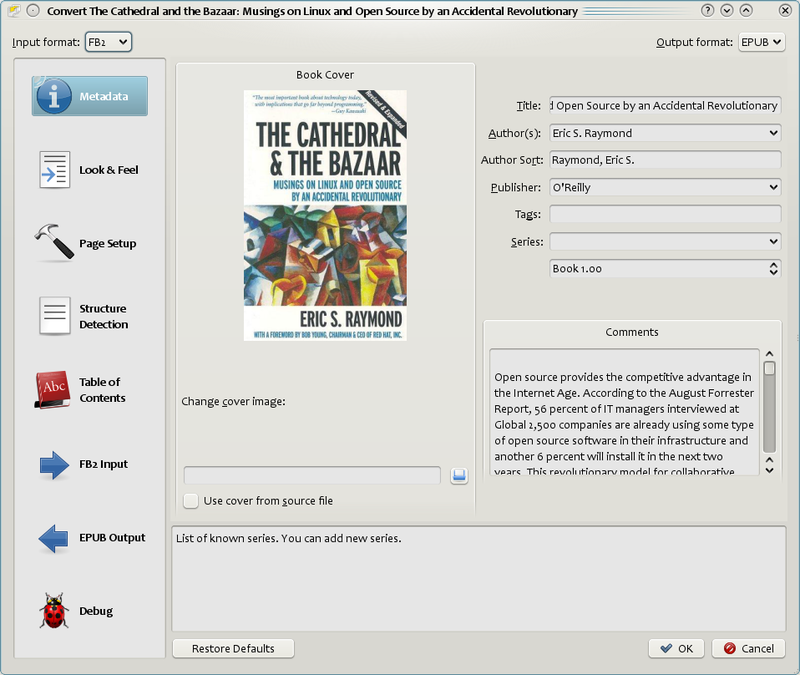 Image tags can used, but calibre does not provide the ability to add the image during conversion, this must be done after the fact using the 'Edit book' feature. When enabled, calibre will look for common words and patterns that denote italics and italicize them. Examples are common text conventions such as ~word~ or phrases that should generally be italicized, e.g. latin phrases like 'etc.' or 'et cetera'. These options are useful primarily for conversion of PDF documents or OCR conversions, though they can also be used to fix many document specific problems. As an example, some conversions can leaves behind page headers and footers in the text. These options use regular expressions to try and detect headers, footers, or other arbitrary text and remove or replace them. Remember that they operate on the intermediate XHTML produced by the conversion pipeline. There is a wizard to help you customize the regular expressions for your document. Click the magic wand beside the expression box, and click the 'Test' button after composing your search expression. Successful matches will be highlighted in Yellow. The search works by using a Python regular expression. All matched text is simply removed from the document or replaced using the replacement pattern. The replacement pattern is optional, if left blank then text matching the search pattern will be deleted from the document. You can learn more about regular expressions and their syntax at Semua berkenaan penggunaan ungkapan nalar di dalam calibre. calibre uses XPath, a powerful language to allow the user to specify chapter boundaries/page breaks. XPath can seem a little daunting to use at first, fortunately, there is a XPath tutorial in the User Manual. Remember that Structure detection operates on the intermediate XHTML produced by the conversion pipeline. Use the debug option described in the Pengenalan to figure out the appropriate settings for your book. There is also a button for a XPath wizard to help with the generation of simple XPath expressions. This expression is rather complex, because it tries to handle a number of common cases simultaneously. What it means is that calibre will assume chapters start at either <h1> or <h2> tags that have any of the words (chapter, book, section or part) in them or that have the class="chapter" attribute. Terdapat sedikit lagi pilihan dalam seksyen ini. The Level 1,2,3 TOC options allow you to create a sophisticated multi-level Table of Contents. They are XPath expressions that match tags in the intermediate XHTML produced by the conversion pipeline. See the Pengenalan for how to get access to this XHTML. Also read the Tutorial XPath, to learn how to construct XPath expressions. Next to each option is a button that launches a wizard to help with the creation of basic XPath expressions. The following simple example illustrates how to use these options. For older .doc files, you can save the document as HTML with Microsoft Word and then convert the resulting HTML file with calibre. When saving as HTML, be sure to use the "Save as Web Page, Filtered" option as this will produce clean HTML that will convert well. Note that Word produces really messy HTML, converting it can take a long time, so be patient. If you have a newer version of Word available, you can directly save it as docx as well. Another alternative is to use the free OpenOffice. Open your .doc file in OpenOffice and save it in OpenOffice's format .odt. calibre can directly convert .odt files. calibre also supports running TXT input though a transformation preprocessor known as Markdown. Markdown allows for basic formatting to be added to TXT documents, such as bold, italics, section headings, tables, lists, a Table of Contents, etc. Marking chapter headings with a leading # and setting the chapter XPath detection expression to "//h:h1" is the easiest way to have a proper table of contents generated from a TXT document. You can learn more about the Markdown syntax at daringfireball. Also, they often have headers and footers as part of the document that will become included with the text. Use the Search and Replace panel to remove headers and footers to mitigate this issue. If the headers and footers are not removed from the text it can throw off the paragraph unwrapping. To learn how to use the header and footer removal options, read Semua berkenaan penggunaan ungkapan nalar di dalam calibre. Note that because this file explores the potential of EPUB, most of the advanced formatting is not going to work on readers less capable than calibre's built-in EPUB viewer. For a nested TOC with Sections marked with 'Heading 2' and the Chapters marked with 'Heading 3' you need to enter //h:h2|//h:h3. On the Convert - TOC page set the 'Level 1 TOC' box to //h:h2 and the 'Level 2 TOC' box to //h:h3. In addition to this, you can specify the picture to use as the cover by naming it opf.cover (right click, Picture->Options->Name) in the ODT. If no picture with this name is found, the 'smart' method is used. As the cover detection might result in double covers in certain output formats, the process will remove the paragraph (only if the only content is the cover!) from the document. But this works only with the named picture! To disable cover detection you can set the custom property opf.nocover ('Yes or No' type) to Yes in advanced mode. The first, most important, setting to decide on when converting to PDF is the page size. By default, calibre uses a page size of "U.S. Letter". You can change this to another standard page size or a completely custom size in the PDF Output section of the conversion dialog. If you are generating a PDF to be used on a specific device, you can turn on the option to use the page size from the output profile instead. So if your output profile is set to Kindle, calibre will create a PDF with page size suitable for viewing on the small kindle screen.